The rescue story of a deer who took an accidental swim. Here’s a story about teamwork to save a deer that attempted to get a drink in a lined pond, and ended up stuck. 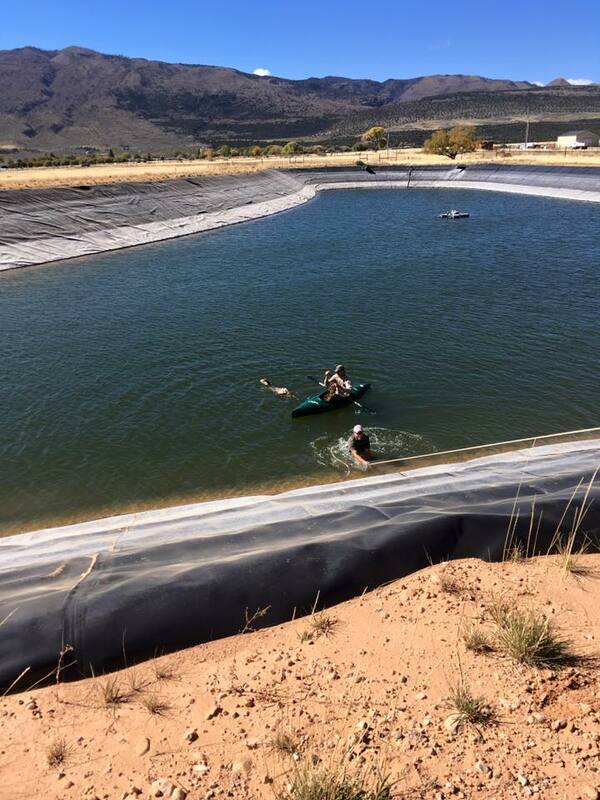 DWR biologists pulling a mule deer from a lined pond in southern Utah. Last week, I received a call from our new Landowner Specialist, Mike Wardle, asking if I could help him get a deer out of a pond. The pond was lined and extremely slippery with a steep gradient into about 15 feet of water. We loaded a kayak and headed out. We also asked other biologists from the region — Teresa Griffin and Richard Hepworth — to bring us a net gun and a ladder, just in case. Thankfully, the local resident who reported the trapped deer had plenty of rope and willingness to help. Our original plan was to lower the kayak into the water, then I’d rappel down to the kayak and corral the deer into a corner where Mike could use the net gun to capture it. Then Teresa and Richard would help lift the tangled deer and Mike out of the pond. After a few attempts, it was clear the deer wasn’t willing to go to the corner, and it was becoming weak from swimming. At this point, I decided to rope the deer in an attempt to drag it out of the water. Of course the deer kicked and I was unable to row and hold the deer, but I had quick teammates that came to help in a steep spot. The deer, though tired, was healthy and ready to get out of there. Richard held a rope for Mike to rappel down to the water (he rappelled a little too far, as seen in the picture), and I threw the rope that was tied to the swimming deer to Mike. Then Mike and Richard used some adrenaline and pulled both Mike and the deer out of the water and off the liner. The deer was then released. 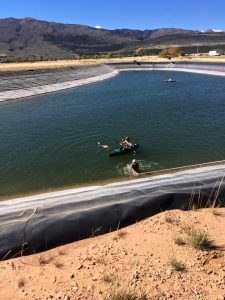 We discussed fencing the pond with the landowner to prevent this from happening again. 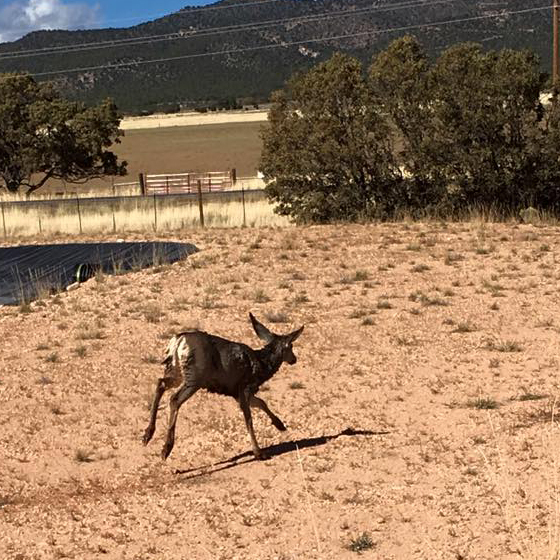 Sometimes, our jobs shift from wildlife management to wildlife rescue, and luckily we have a team of dedicated professionals (and concerned citizens!) willing to do whatever it takes to help out in sticky situations like this.